I suppose one could make the case that azomethine imines are a subset of azomethine ylides, but I’ve never seen it done. What am I missing here? 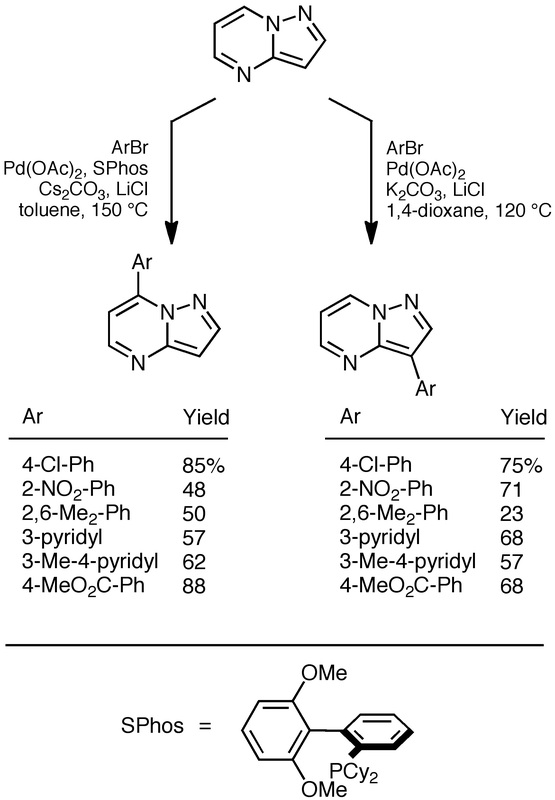 The direct functionalization of aromatic heterocycles at ring C-H bonds via transition metal-catalyzed processes has become a powerful alternative to electrophilic aromatic substitution. 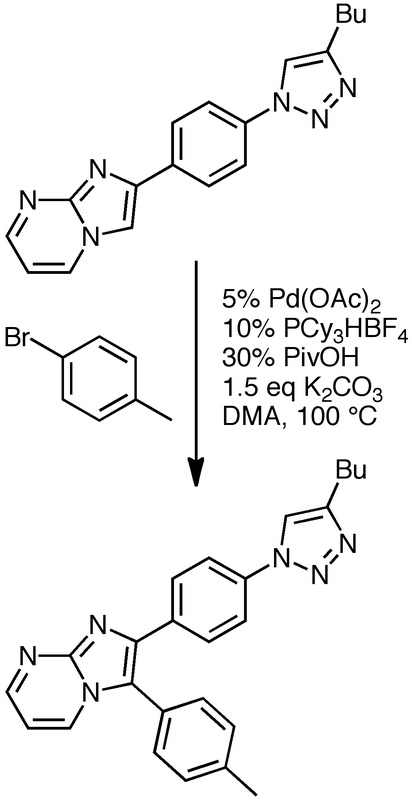 Arylation, benzylation, alkenylation, and amination of aromatic heterocycles are possible, largely via palladium or copper catalysis. There are hundreds of papers describing the functionalization of both five- and six-membered ring heteroaromatics, but here’s the rub: How can one predict the regioselectivity of these reactions? A recent paper by Daniel Ess and co-workers at BYU (Organic Letters) moves us closer to that goal. Let’s say you’re in the drug discovery business and would like to snap a bunch of different arenes onto a core structure. Where will they go? Regioselectivity is often high (c.f. 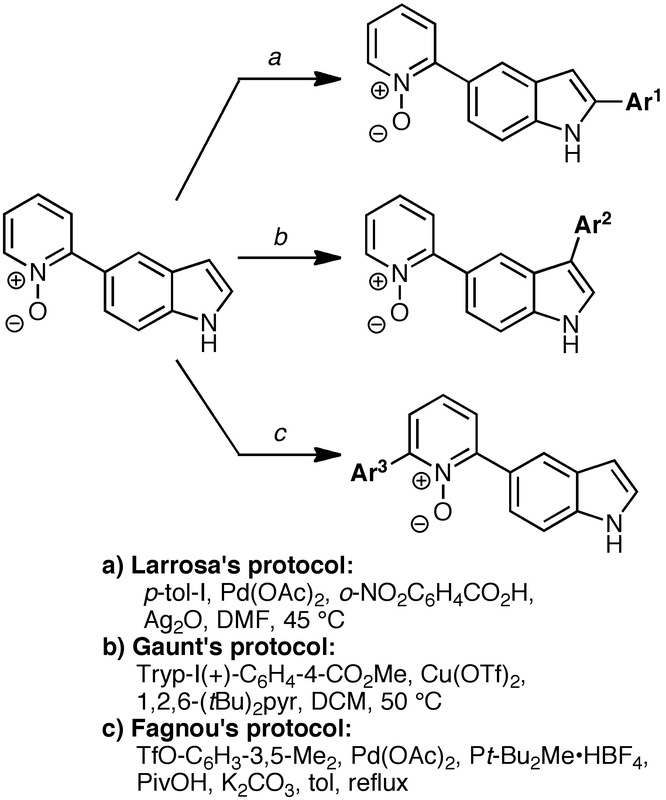 the example from Lapointe, Fagnou, and co-workers below), but how can we rationalize and predict the regioselectivity, especially in cases where there is no directing group present? 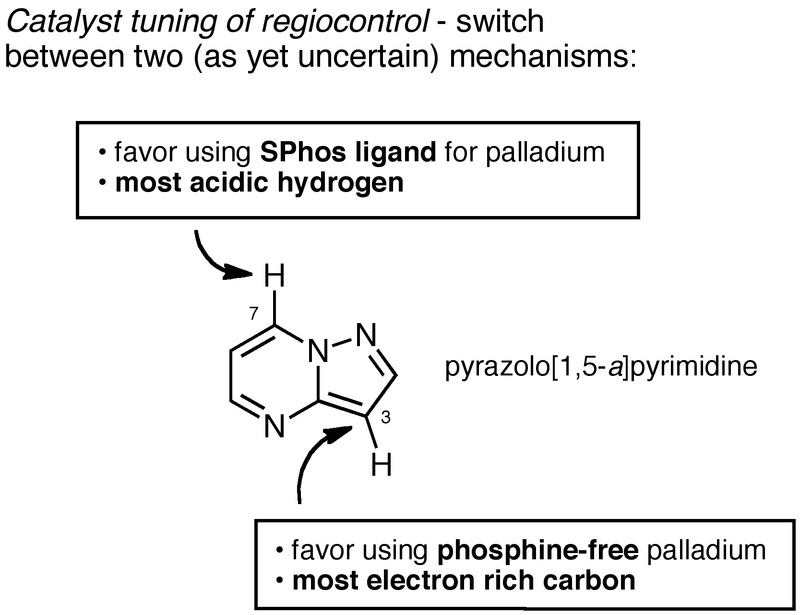 Ess and co-workers summarized the work that has been done so far on rationalizing the regioselectivity of these reactions. I would also suggest looking at the Lapointe/Fagnou paper cited above, which focuses on the same issue. C-H bond acidity, carbon center nucleophilicity, steric and stereoelectronic effects, activation-strain analysis, etc., have all been posited. If you have the software, know-how, and patience to calculate the geometries and energies of all of the relevant transition states, go for it. In that vein, I’ve shown an exemplary transition state from Ess’s (that’s a lot of esses!) paper below, which features the widely accepted six-membered ring CMD (concerted metalation-deprotonation) mechanism. Shown is the transition state for the reaction of pyrazine-N-oxide with PhPd(PMe3)OAc. But who wants to calculate transition states? Well, Ess has uncovered an attractive shortcut: He and his co-workers, upon noting that the CMD step is inherently endothermic and thus has a late transition state, postulated that all you really need to know are the relative thermodynamic stabilities of the palladium aryl intermediates. After all, in a late transition state, the C-Pd bond is well along the way to being formed, so a higher C-Pd bond strength should be correspond to a lower TS energy. 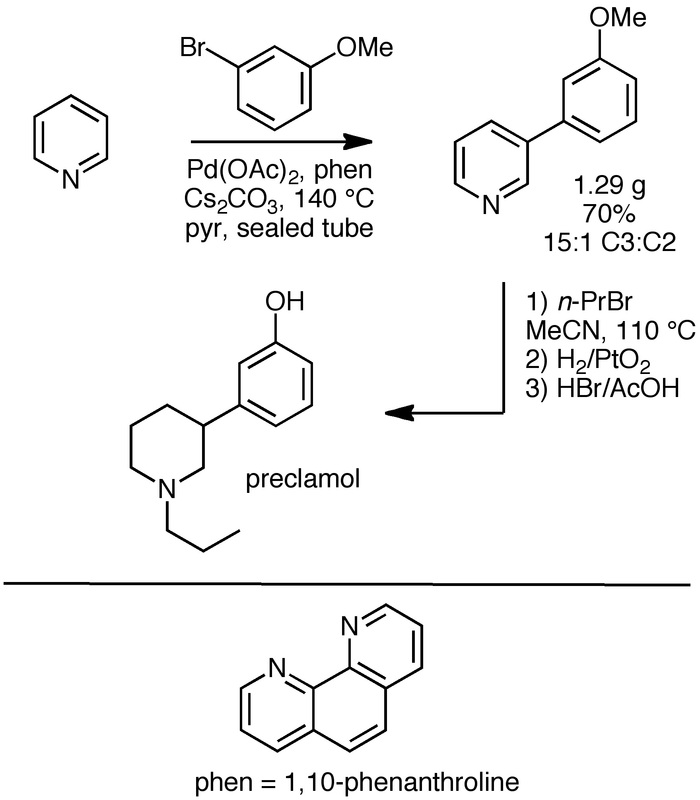 Indeed, after adjusting for some hydrogen bonding effects in certain substrates, they found that the regioselectivity of fourteen out of fourteen examples were correctly rationalized by estimating the thermodynamic stability of the palladium aryl intermediates, a much easier task than TS calculation. …the strongest C-H bond (in the substrate) will be preferentially activated since it will lead to the most stable Pd-C bond. Indeed, for arenes and heteroarenes 1 – 14 the strongest C-H bond generally has the lowest activation energy. 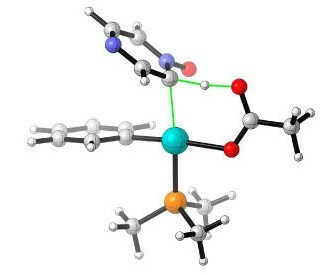 Now the task becomes a “comprehensive thermodynamic analysis of palladium aryl bonding,” which “will be the subject of a future detailed study.” Add in an understanding of C-H bond strength in heteroaromatics and these reactions will be even more attractive.